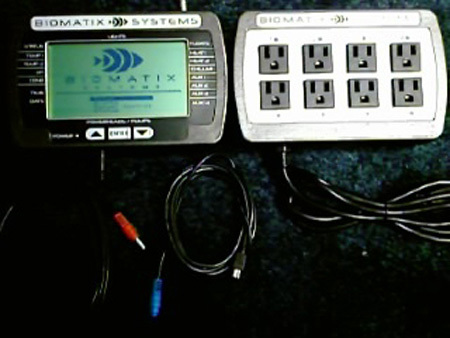 I spoke to Chris at Biomatix yesterday; I had a great conversation with him and found out a lot of information on Biomatix�s new controller, he went through all the hardware features of the product and gave me a basic description of how the system is structured and put together. For now I have very little detailed information on the programming and actual operation, I expect to have much more information on that as the product gets nearer to launch date. Controller next to 8 Plug Power bar, Salinity Probe (Red) and Temperature Probe (Blue) *Note status light next to each plug on power bar. This picture next to the Power bar gives you a good size comparison to see just how big the LCD really is. 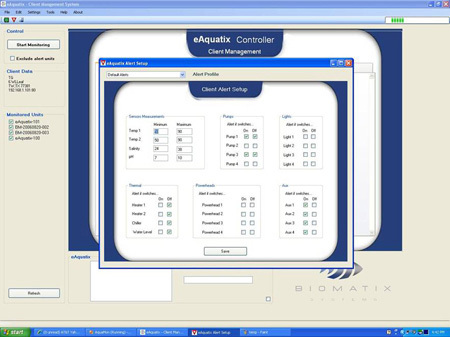 The Client Manager Software is for multiple tank monitoring. This allows installers to monitor their customer�s tanks remotely. Notice on left, that a list of clients is displayed. The user can select which tank he wants to monitor. Client Software: Alarm Management system. From what I have seen so far, the Biomatix is very impressive and nicely designed controller. 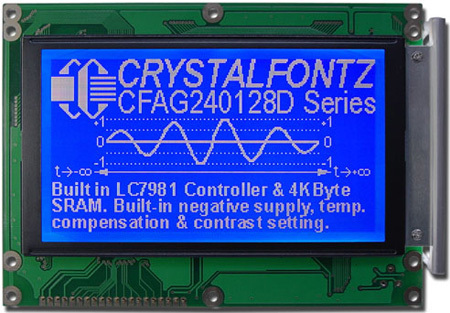 It has a super large Graphical LCD that incorporates Real time graphs and Icon selection for programming. 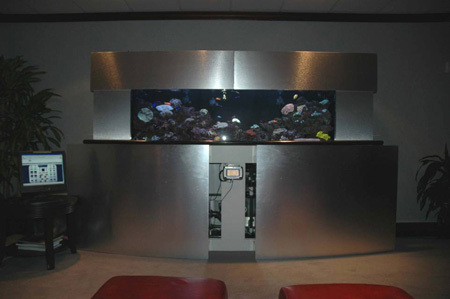 The unit is designed so that it can display every parameter of your system for easy viewing at a glance. The three button control system is simple and elegant and makes it easy to scroll through the Icons that make up the Menu. This makes a great system for programming all your tanks settings without having to learn specialized commands or wading through layers of menus. 1 Optional port for 2nd pH or ?? Built in FTP Server for uploading files to the controller, these files are then used to upgrade the Firmware. Based on the specifications this is a very impressive unit, I cannot help but too fall in love with the gorgeous display and all the Data that is packed onto the single screen. 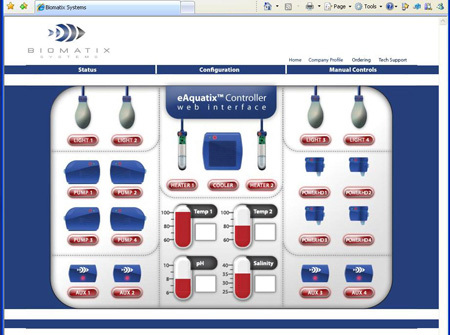 I like the fact that rather than looking at numbered plugs and cryptic labels the Biomatix shows you the status of the lights, chillers and the pumps in a clear easy to read manner. The overall system is well thought out and functional, the 24 power plugs are more than adequate for most users and the use of USB style ports are a nice touch. My one initial worry was the lack of expansion ports. Just like the Profilux I think expansion has been overlooked on the Biomatix, but Chris seemed to be on top of this issue and is aware of the need for additional ports, I feel confident that this is something they will be addressing as soon as the product is on the market and gone through its first few months of real world use. One other interesting point is that this controller seems to be geared towards use by professional tank installers as well as the home market. 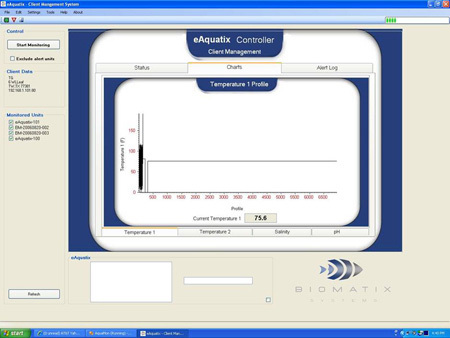 The Pro market is one area that seems unsupported so far, so it seems as if Biomatix has created a perfect mix of controller and software to satisfy both the home market and the professional installer/maintenance companies. 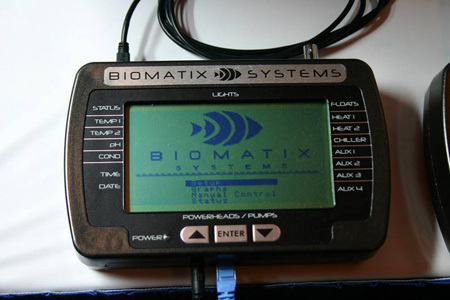 I look forward to seeing one of these units in person and writing a more detailed review, the Biomatix really looks very promising and it will be very interesting to see how the unit operates. Look for it to be on sale by Mid March 2007. Talked to Biomatix a few days ago and they say they are a little behind for the release date. The first batch of Controllers will be going out early April to a group of Professional installers; units for the General public should follow a few weeks later. 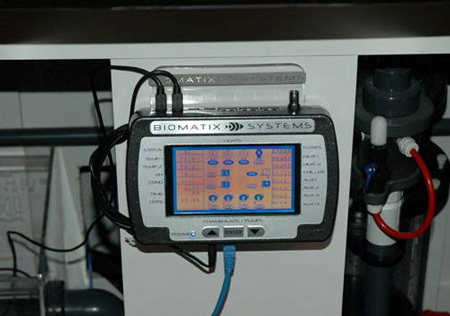 Biomatix gave me some recent pictures of the system being Beta Tested on one of their Pro Installers tanks.